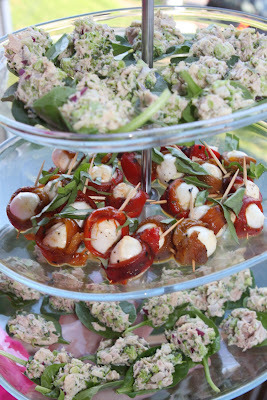 This was another appetizer I saw and instantly bookmarked, waiting for the perfect party to make them. We were celebrating my friend’s birthday, and decided to eat at home before heading out for other *ahem* respectable adventures. This is an incredibly simple appetizer, I can’t believe I’ve never thought of it myself! I really liked the healthy additions of broccoli and the other veggies in the tuna salad. I forgot to add the red wine vinegar the original recipe calls for, but it tasted great nonetheless. I just sort of began to make it the way I usually do, adding in green pepper, because I always put that in my tuna salad. Also, because I was making this for a party, I tripled some of the ingredients in the original recipe (but I didn’t triple the onions, as I felt that 1/4 of a cup was PLENTY), and that is what I have posted below. Drain tuna. Mix all the ingredients and serve in freshly washed spinach leaves. Those look really good, and a great “light” app for a party! Those are so cute. I love the idea of serving them on spinach leaves.